The Spanish enjoy some quirky and unique Christmas traditions. Why not immerse yourself in a different culture this December with a Christmas break at Villa El Cano in Marbella. From December 22nd-29th up to 20 of your friends and family can experience some of the incredible Spanish traditions in the local area, whilst still embracing your British roots and enjoying an delicious Christmas meal cooked by your own private chef on the 25th. Nochebuena or Christmas Eve is the most cherished of all family gatherings in Spain. Most families eat their main Christmas meal on Christmas Eve, before going to Midnight Mass or ‘La Misa Del Gallo’ (The Mass of the Rooster). It is called this because a rooster is supposed to have crowed the night Jesus was born. Traditionally Spanish children don’t get their presents on Christmas Day but you may have a few issues trying to get your little ones to embrace this part of the culture. Children have a few presents on Christmas Day, but most are opened at Epiphany on January 6th. On December 28th, you’ll have to have your wits about you as 'Día de los santos inocentes' or 'Day of the Innocent Saints' is very much like our April Fools Day. Friends and families go to great lengths to play tricks on each other. New Year's Eve is called 'Nochevieja' or 'The Old Night' in Spain and one special tradition is that you eat 12 grapes with the 12 strokes of the clock at Midnight,making a wish for good fortune in the months ahead. Some say that this tradition started in 1882 when a group from Madrid headed to the famous central plaza of Puerta del Sol and ate grapes as the clock struck midnight to mock the upper classes who drank champagne and ate grapes all night long. Others say it was a clever marketing gimmick when in 1909, grape farmers had an overly abundant harvest and needed a way to quickly sell their grapes. By saying that eating grapes brought about good luck, it quickly became a household institution. Children believe that the Three Kings bring presents and not Santa Claus. The children send letters to the Three Kings of Orient – Melchor, Gaspar and Baltasar – who travel bearing gifts for children who have been good throughout the year, and coal for those who have been a bit naughty. On the evening of January 5th, the Kings arrive in Spain and visit every city and village, where they’re welcomed with a fun-filled parade. On the morning of January 6th, families eat the Roscón de Reyes, a delicious, brioche-like cake with candied fruit on top. Hidden within the cake is a small toy king and a bean. Whoever gets the slice of the cake with the small king will have good luck for the rest of the year and whoever gets the bean must pay for the Roscón! As well as these unique traditions, the Spanish really know how to bring Christmas to life in their towns and cities. 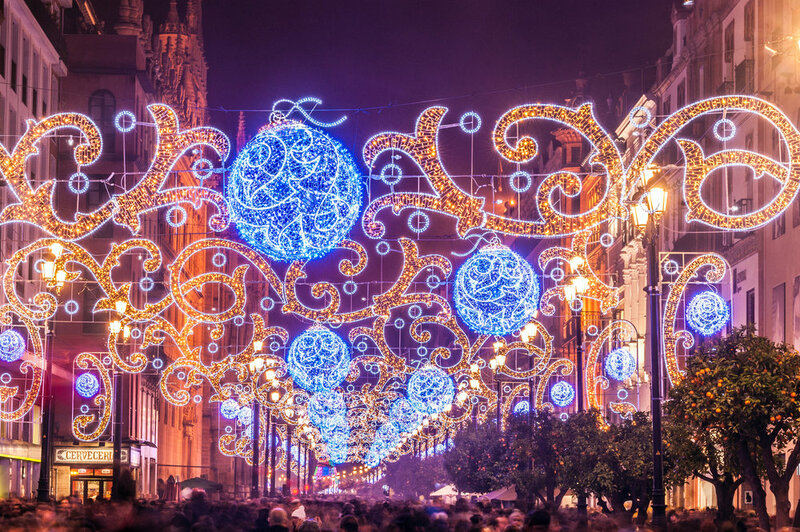 With stunning light displays, nativity scenes and festive themed concerts in the streets and plazas, you’ll have a truly magical experience. Just an 8 minute drive from the DSV Collection villas, the beautiful marina town of Puerto Banús really is ‘Like No Other’ and the tourist board have just launched a new digital campaign to showcase this. Its nautical facilities, its unique luxury shopping and its enviable climate, with more than 300 days of sunshine, seduce millions of visitors every year. Since its creation in 1970, this must-visit Marbella destination really has become a playground for the rich and famous - attracting celebrities, royalty and aristocrats. From Audrey Hepburn and Cary Grant of yesteryear through to the likes of Robert de Niro, Hugh Grant and Michelle Obama. Fortunately Puerto Banús is close enough to our villas to enjoy the world-class shopping, stunning beaches & coastal views and superb gastronomic experiences but it’s far enough away to give your credit card a few hours of necessary respite. Just a few of the brand names that will test your shopping impulses include Dior, Yves Saint Laurent, Louis Vuitton, Gucci, Jimmy Choo and Tom Ford. Multi-million pound yachts and impressive sports cars adorn the marina. So if you’re looking for inspiration to buy your own, or you just like to dream of what to buy with your future lottery win, the fantastic restaurants and bars provide the perfect vantage point. Whether you’re a big or little kid, it really is a place not to be missed on your visit to Marbella and the DSV Collection villas will provide the perfect base for your visit. Our villas are the perfect place to welcome friends and family for an evening of delicious food, drinks and laughter. Make memories by hosting your very own luxury dinner party, making use of all the seasonal and traditional food Spain has to offer its visitors. Our guests come to us for a variety of reasons; some to relax, some to party, some to work, but more often we are seeing groups coming to work-out! Check out upcoming weight loss bootcamps and get some Summer fitspiration in our latest blog post. Planning a family vacation for you and your loved ones can be a stressful prospect. Our aim at the DSV Collection is to take away any undue hassle so that the whole family can enjoy the best possible trip away, filled with fun, laughter and memories! Sitting by the pool at Villa El Cid or Villa El Cano with a glass of our delicious Cava Sangria in hand, there is no place you'd rather be. With a recipe adapted from some of the best in the business, this cocktail is something special to take your luxury vacation to the next level. Salud! The DSV Collection is made up of two premium villas, El Cid and El Cano, both complete with 10 double bedrooms each. The properties provide the setting for the ultimate golf vacation: combining privacy, luxury and most importantly; accessibility to some of the best golf courses Marbella has to offer.